Flip through a glossy magazine or click through an entertainment website—you’ll often notice headlines heralding the next big superfood that will cure all your problems. The truth is, we’re constantly on the hunt for that one magic superfood, genius health trick, or secret celeb habit that will instantly overhaul our figures, give us mental clarity, and bestow on us a healthy lifestyle. With countless remedies for every health issue out there, food trends are so over the top nowadays that we’ve become overwhelmed. However, we’ve recently heard about MCTs and you know what? They actually make a lot of sense. But first, what is MCT? Also known as medium­chain triglycerides, MCTs boost your metabolism, gives you instant energy, and helps improve brain function. In short, it’s the perfect super fuel for busy urban dwellers who want to take care of their health while dealing with a high­stress lifestyle. MCT is a unique form of dietary fat that occurs in coconut oil, palm kernel oil, cow’s milk, goat’s milk, and breast milk. But before you balk at the word “oil”, know that MCTs do not behave like typical fats. They do not accumulate in the body as fat or circulate in the blood where they can potentially clog up the arteries. In fact, MCTs can be absorbed and metabolised rapidly by the body to produce energy, improve cognitive functions, and boost alertness. Even better—MCTs promotes fat burning, making it an excellent dietary supplement for office workers who want to watch their weight. So how does it work? What you should first know is that there are different types of fats, categorised by how many carbons they have: short­chain fats (like butyric acid), medium­chain fats, and long­chain fats (like omega­3s). Compared to longer­chain fats, MCTs are absorbed more easily since there’s less work for the body to break apart carbon bonds. Bottom line: they’re easier for our body to use, since they don’t require any special enzymes to assimilate the benefits. They go directly from the small intestine to the liver and convert into ketones, an energy source that works like fuel for our brain, making us more alert and active during long office hours. Unlike most health supplements that take a while to kick in, the effects of MCTs can be felt almost immediately. When taken in the morning, it effectively powers up the body for the day ahead. Feel yourself flagging around late afternoon, but still have a lot of work to get through? Just add a little MCT to your beverage for a pick­me­up! MCTs are also believed to improve brain function as ketones are delivered directly to the brain for fuel. Busy executives and students will benefit from better alertness and focus for longer hours. What makes it different from coconut oil? We often see articles talking about the various health benefits of coconut oil, including the MCTs it contains. However, regular coconut oil only contains 15% effective MCT. 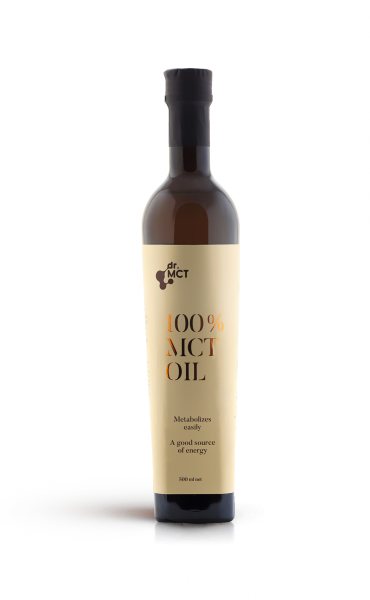 If you have the opportunity to do so, why not try out a 100% pure MCT oil produced by dr. MCT? The benefits of one tablespoon of MCT oil rivals 7 tablespoons of coconut oil, making it way easier to include in your daily regime. Plus, it is odourless and unflavoured, and can be either taken on its own or easily added to any food or drink. Wondering how to use it? Why not start off by including it in your avocado shake or coffee, use as a salad dressing, or simply add a spoonful to your meals?